How do I file a TDS returns online? TDS (Tax Deducted at Source) is a system of government in which a person as engaged in a transaction specified under the TDS rules, have to deduct a certain amount of tax while making certain payments . The person has to deposit such amount collected directly to the government by filing a TDS return and a TDS filing challan and submitting the required amount collected. TDS is usually deducted in a range of 1% to 10% or might up to 20% in case of non-submission of PAN/TAN details. Form 26Q – For TDS deducted in any other case. Form 27A – Form containing the summary of all returns filed. Who should file a TDS return? – If Deductor or collector is a person whose accounts are to be audited under section 44AB in the last financial year. – If the number of deductees recorded in the statement to a specific quarter is 20 or more. 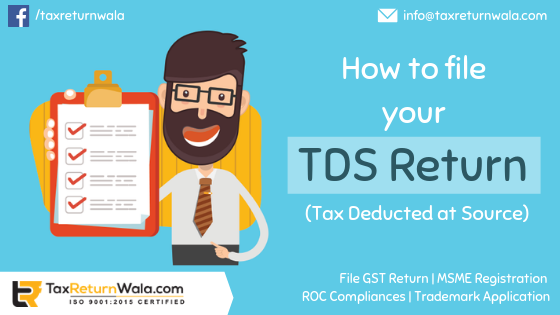 What are the Prerequisites for filling a TDS return online? – a Valid DSC (Digital Signature Certificate) if want to opt for filing with DSC. – The bank account, PAN and demat account (if any) details of both the deductor and the deductee. How to file TDS return online? Step 1. Register your TAN on the E-filing portal of Income Tax Department if not done. If done already login to the website with TAN details. Step 2: Download an offline Return Preparation Utility (RPU) and (File Validation Utility ) from TIN-NSDL website. (https://www.tin-nsdl.com/downloads/e-tds/eTDS-download-regular.html). This will be required to fill in details of the return to be filed and match the details with a CSI file. Fill in the period for downloading the CSI file which includes all the challan files you have mentioned in your return and the required details. Step 3: After installing both the Utilities, open RPU and select the required Form number and select Regular, then click to continue. Step 4: Fill in all the required details in the return and click save. Step 5: Click on ‘Create a file’. A dialog box will appear, in the first field ‘Challan Input file’ select the Challan- CSI file you downloaded above. Step 6: On the same dialog box, select the folder directory where all files are to be generated and saved. In the folder directory, few files will appear out of these details can be re-verified from the file named ‘27A’ and a file named with extension ‘.fvu’ which is to be converted to a ZIP file. Step 8: Click on TDS > Upload TDS. Step 9: Fill in the required details including FVU version, Quarter of filing and Upload type as Regular etc. Step 10: File your Return either by your registered DSC (Digital Signature Certificated) or EVC (Electronic Verification Code). Step 11. Attach the zip file converted earlier. E-verify your return and click on upload. That’s it! Within 2-3 days the status of the filed return can be viewed on the TRACES web portal. Finding difficulty to submit a TDS return online? Let our tax expert guide you with the process at info@taxreturnwala.com.